For more information about the Prophecy Nursing Assessments visit www.ournextnursehire.com/prophecy or contact David McParland at 877-773-4473, ext. 700 or by email at dmcparland@prophecyhealth.com. by Daniel Biddle, Ph.D., President, Biddle Consulting Group, Inc.
Research was recently completed on a three-part assessment battery (called “Prophecy”) that is designed to measure the “whole person” when it comes to nursing. This assessment was created by three testing firms (Prophecy Healthcare, Inc., Biddle Consulting Group, Inc., and PeopleClues), who joined in a two-year study with Saint Francis Medical Center (Cape Girardeau, Missouri) and Frederick Memorial Hospital (Frederick, Maryland). These two hospitals provided 837 nurses and 39 nurse supervisors who rated each nurse on 19 dimensions of job performance. Their performance ratings were correlated to the three assessments that were developed in the study: Clinical tests (job knowledge tests), Situational Judgment (video-based interpersonal skills test), and a Behavioral personality test specifically validated for nurses. 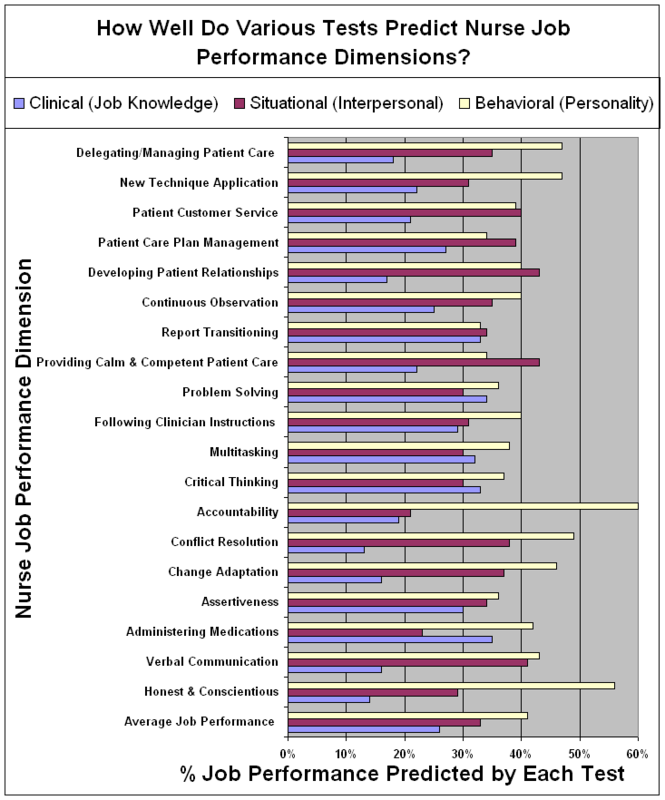 The research revealed that this multi-faceted selection system forges a powerful selection battery that is highly predictive of job success (the correlation between the three tests and job performance was an outstanding r = .67), which is one of the highest reported in the nurse testing literature. This strong validity was only possible using a selection strategy that measured the “whole person”: book knowledge, interpersonal competence, and personality. The chart below shows how each of the three test components worked to predict 19 different dimensions of job performance that were evaluated in the study. For example, the three tests predict Multitasking relatively equally (between 30% and 40% each); whereas, Honest and Conscientiousness work practices were most effectively predicted by the Behavioral, Situational, and the Clinical (in this order). Because of this strong correlation to job performance, healthcare facilities using Prophecy can greatly improve the “utility” of their nurse hiring processes. For example, making the assumption that 60% of the incoming nurses are qualified (i.e., would receive job performance ratings of average or higher), facilities that hire highest-scoring 40% of test takers will hire nurses who are 86% likely to receive job performance ratings that are at least “average” or higher. This 26% gain (86% v. 60%) is a substantial strategic advantage gained by using validated testing practices like Prophecy. Facilities hiring the top 20% will place nurses who are 93% likely to be rated average+ on the job. “Prophecy” is named after this unique ability to predict the future performance levels of incoming nursing staff. Prophecy also results in substantial financial gains for facilities. For example, small healthcare facilities that hire between 20 and 50 nurses annually will gain between $1m and $2.5m (every year) in performance advantages by using Prophecy. The annual gains are much higher for larger facilities, with up to $10-$15m for facilities that hire 200-300 nurses annually. If you’d like to know more about using the Prophecy Nurse Assessments in your healthcare organization, please visit the Prophecy Healthcare website at www.ProphecyHealth.com. Are the Prophecy Nurse Assessments legally defensible? Biddle Consulting Group has released a new report regarding the legal defensibility of the Prophecy nurse assessment tool. This report is for Prophecy clients or those who are considering using Prophecy as their pre-employment nurse testing solution. This easy-to-read report provides answers to questions regarding Prophecy Assessments and its compliance with Equal Employment Opportunity (EEO) laws. Appendix A: Background on Biddle Consulting Group, Inc.